Who would have thought that a movie about a giant vicious boar would be so cool. 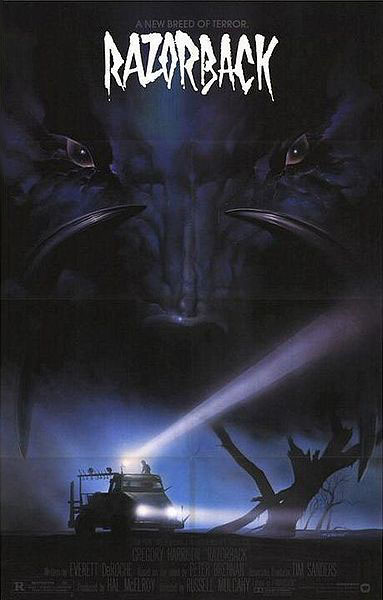 Razorback, dating back to 1984 (the year of the Big Brother), remains a unique and memorable film for many reasons. First, it was one of the first horror films from Australia, a country which was never quite prolific at the genre but its few offerings have always managed to surprise. But most importantly, Razorback was truly Australian in spirit by prominently featuring its fauna and desolate deserts. In fact, the movie takes advantage of its plot to convey concerns about unbounded animal killings (in this case, kangaroos being used as dog chow) and certainly manages to get the message across. It’s all quite scary if you think about it, considering the movie remains so valid in this regard well over two decades later. I’d be tempted to say that Razorback and the other classic Aussie film Long Weekend were among the first movies tackling the “real” eco-thriller genre, where Nature fights back people for their inconsiderate behavior (no, I don’t think Jaws and similar monster movies would fall in this category). Razorback is very efficient at worrying and scaring us in equal parts, although it’s certainly tamer in this aspect when compared to Long Weekend which is far more menacing, to say the least. The movie itself deals with several characters hunting the Razorback, which would be an anomaly of Nature prowling the deserts of Australia. The creature is a gigantic boar or pig, I suppose depending on the country you live in, that from time to time preys upon people. The first attack depicted in the movie is an infamous and very disturbing scene where the Razorback takes a child resting in a cradle from his grandfather and nearly destroys half the home in the process. The man goes on trial for this because obviously no one believes his story about a giant boar and condemn him for the disappearance of his grandson (curiously enough, no one seems to mention how on earth the old guy managed to wreck his place like that). The plot then follows a female reporter precisely dealing with kangaroos being turned into dog food who suddenly goes missing (hint, hint) and the American husband traveling to Australia to look for her. He will eventually meet the old guy who’s now free and they will go merrily after the Razorback. It’s all terrific fun with a great pacing that never bores and concludes in a very tense finale. This is topped with some breathtaking shots of the barren Australian desert, turning it into a surreal and eerie place. The effect is further enhanced by electronic music reminiscent of Tangerine Dream which gives the movie a very particular ethereal feel. It’s worth mentioning that Razorback was directed by Russel Mulcahy would eventually become a renowned director with Highlander, his greatest hit. If you recall, Highlander had a pretty rocking soundtrack by Queen and this is also the case with Razorback which features songs from the likes of INXS and Duran Duran (this is pure 80’s goodness we’re talking here!). All in all, a stylish and fun movie that has aged very well and is definitely worth your time.